The Crafty Lady: Why Acrylic? 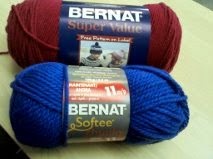 We have so many beautiful yarns in our store! 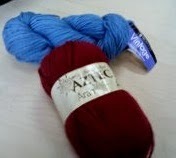 Cushy alpaca, lovely llama, smooth silk, soft as can be merino, so why would anyone choose to knit with acrylic? If you can knit with gorgeousness, why would you choose acrylic? Well, there are lots of reasons. 1. Not all acrylic is horrible. We carry high quality acrylic. It's lovely, it's soft, it's easy to work with, and even some of our beloved yarn snobs will knit with James C. Brett's Marble because it's just that good. 2. Some people are allergic or have skin sensitivities to wool. Even the softest wool. Wool has come a long way since the 80's and it's not all scratchy anymore, but there can still be issues. A few years ago, my sister who lived far away surprised me with a beautiful sweater she had knit out of wool. It was gorgeous! And I couldn't wear it. It was made with high quality wool but it made me itch like crazy. If I put it on I was doing interpretive dance. None of my children could wear it either because they inherited my wool allergy. Sadly, I had to give it away. When I first started working here, I had to wash my hands a lot. Touching wool would make me itch all over. And it wasn't psychosomatic. Often I would have no idea what I had touched when my hands would start itching. Miraculously, I can touch most of the yarns in the store now, even the wools, - I guess I built up some kind of immunity - but you still won't find me playing with the roving, learning how to felt, or even knitting wool socks (the idea of sweaty feet in wool reminds me of that fairy tale of the girl who couldn't stop dancing). 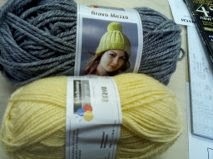 However I am enjoying merino! When you come in to make a gift out of wool, are you sure that the recipient can wear it? If it's for a baby, do you know if baby's sensitive skin is sensitive to wool? Sometimes choosing acrylic is the smarter choice. After all you don't want Mother tearing her hair out trying to figure out where the rash came from. Most mothers don't want to be bald. 3. Easy Care. 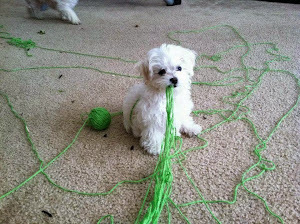 You are making a beautiful blanket for baby. You have chosen the softest merino wool, or alpaca and you are lovingly creating each stitch for that adorable baby girl in the prettiest pinks and purples you can find. Then you present it to baby's mother with the instructions - you have to hand wash this, lay it flat, then you might have to block it whenever it gets out of shape. Suddenly that lovely gift has turned into another chore for mom. She may even sincerely promise to take good care of that layette set, but babies are messy. They spit up, they poop, they snot, and moms get busy and suddenly lovingly taking care of that beautiful blanket becomes one more thing in between all the other stuff she has to do. Do you really want her cursing you under her breath every time she has to wash that blanket? Either that blanket will end up in the regular laundry and be ruined, or it will make it's way to the bottom of a drawer never to be seen again. And if by some chance as baby grows she gets attached to that blanket, then think superman cape, sailboat, flying carpet, stress reliever, sleeping pill, hula skirt, rope to tie up brother, - well, you get it. That blanket will be used for everything and although wool will hold up to it, it won't hold up in the washer and dryer. So unless that beautiful blanket is destined to be an heirloom used at a christening ceremony, or hung up on a wall where vomit doesn't go, then acrylic is probably best. And if you think a young man is going to lovingly take care of a wool garment, then guess again. Even superwash wool can't be thrown into the dryer. Basically, if he can't throw it in the washer and dryer then don't do it in wool. He may send his suits and ties out to the cleaners, but probably not a toque. 4. Price point. We believe everyone should be able to knit, no matter what their economics dictate. Not everyone can plop down a hundred bucks for a sweater. They have other things to think about, like rent and food. Even if you have a woman who's willing to go hungry to buy yarn, she may have a husband and children that wouldn't agree. So for her, she may only be able to afford acrylic yarn and plastic needles. We appreciate her too. We also have people coming in who want to learn how to knit. Now as we all know, learning something new can lead to a wonderful addictive hobby, or it can mean one more thing buried under that mountain in the closet that everyone denies exists, because if it's acknowledged it will have to be cleaned out. 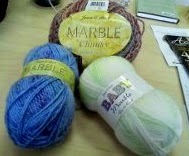 So it makes sense to start with inexpensive yarn and needles. 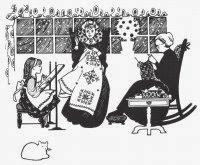 Once the addiction happens, then the wooden needles and flying sheep occur. 5. Acrylic materials are frequently blended with natural fibers. In socks that can mean that nylon is added to wool for strength. Or it can be added to create an easier to care for garment. Or it can lower the price. Often when you touch these blended yarns you can't feel the acrylic at all! Although the James C. Brett Aztec has only 10% alpaca, it feels like 100%! So the next time you feel like you need to carry a wooden cross through the acrylic aisle, just remember, acrylic can be our friend. Our Sheep Has a Name!